How much can I make driving with Airspace? - Drivers in San Francisco are making between $11 and $30 dollars an hour on average. - Drivers in Los Angeles are making between $13 and $25 dollars an hour on average. - Drivers in San Diego are making between $16 and $20 dollars an hour on average. HOW MUCH SHIPMENT VOLUME CAN I EXPECT IN MY AREA? We have nationwide coverage and actively facilitate shipments throughout the United States. Our volume fluctuates based on geographic area, customer requirements, and other factors; but our growth has fueled steady increases across the country due to our dedicated driver base. Each shipment is unique for Airspace Technologies. We average between 20-35 miles per job. However, in many areas, we see high concentrations of shorters or longer drives depending on customer needs. WHAT TYPES OF SHIPMENTS WILL I BE TRANSPORTING? We work with some of America's largest and most respected companies to keep their operations running. Anything an organization may need to keep their operations running, we may transport - from aircraft parts, cash registers, semiconductors, medical devices or organs for transplants, we've shipped it. WHAT INFORMATION ABOUT AIRSPACE CAN YOU TELL ME? Airspace Technologies is a technology-enabled, time-critical service provider. We integrate technology, people, and services through an industry-first, automated software platform that gives our customers a true end-to-end supply chain solution with full visibility. We created our technology platform to eliminate the transparency issues and challenges that customers face today. ARE THERE ANY VEHICLE REQUIREMENTS WHEN DRIVING WITH AIRSPACE? As an independent contractor, you will be transporting shipments on Airspace's behalf using your own vehicle. At Airspace, we accept all closed body types of vehicles as long as they fall within TSA and our customer requirements. 90% of our shipments are transported via sedan/hatchback. Some common vehicles that are not allowed are pickup trucks with an open bed, motorcycles, vehicles with expired registration or tags, or damaged/inoperable vehicles. WHAT IS AN STA NUMBER, AND WHAT DOES IT DO? An STA number is a Security Threat Assesment number. This number is provided by the TSA once an STA application has been submitted. DO I NEED TO BE TSA CERTIFIED TO DRIVE FOR AIRSPACE? While transporting any shipment associated with a flight, the TSA requires all Commanders to go through the TSA certification process. At Airspace, we will work side-by-side with you to become TSA certified and trained so you can begin earning more money as an Airspace Commander. I AM TSA CERTIFIED, DO I HAVE TO FILL OUT THE STA APPLICATION? Yes. Per TSA regulations, we are required to have a completed STA application for each of our independent contractors. We can, however, expedite your STA application with your active STA number. What tasks will I complete while driving? When transporting a shipment, we make it simple. 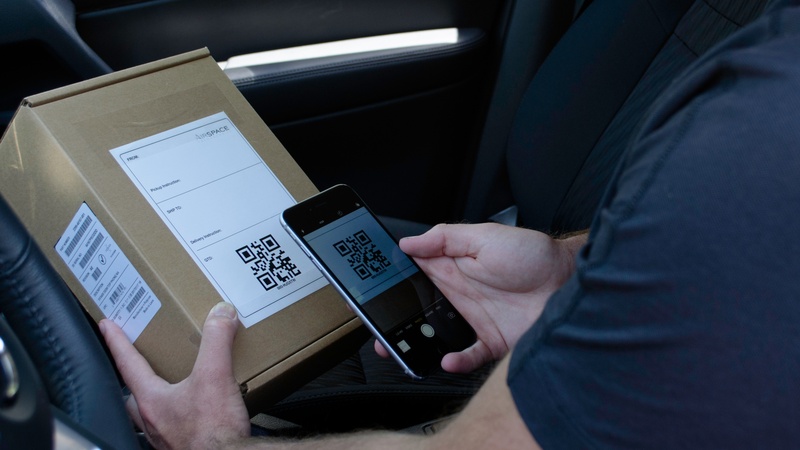 By utilizing our CourierConnect mobile app, we streamline the delivery process to simplify scanning packages, generating the fastest route, delivering shipments, and providing accurate proof of delivery reports. If any additional paperwork is required, an operations specialist will always assist in completing the correct documentation. I own a transportation company, can I still apply? What is the best way to talk to a representative? Each pay period begins on Saturday at 12:00am and ends on the following Friday at 11:59pm. You will receive an email on Tuesday afternoon with your payment statement. Please email any payment changes to partnerspay@airspacetechnologies.com by 11:00am PST the next day, Wednesday. Please note we are unable to consider any changes emailed after 11:00am PST Wednesday. Your earnings will be sent to you via direct deposit into your bank account by Friday following the pay period. Your pay is calculated by adding the base fare, mileage rate, wait time, miscellaneous and subtracting the On-Demand Independent Contractor Association (ODICA) insurance deduction. And then a $1.00 security maintenance fee is deducted from your payment statement weekly. This covers regulatory, safety, and operational costs such as your STA application fee, Change 6 Test, and document maintenance. Base Fare: This is applied to each fare and covers up to the first 15 miles of your trip. Mileage Rate: This is the per mile rate applied to the distance of the trip from pickup to drop-off after 15 miles. Wait Time: This is the time you have to wait to pick up a shipment. Occupational Accident Insurance Deduction: In order to drive with Airspace, you need to have On-Demand Independent Contractors Association (ODICA) insurance. If you decide to enroll into OneBeacon’s Occupational Accident Insurance, $1.84 will be deducted from each trip. The traditional Occupational Accident Insurance would cost about $1,500 per year, on a stand alone basis. The benefit of this program is that there are no upfront costs, and the insurance is simply billed as the deliveries are made. You are free to obtain your own ODICA insurance for Airspace deliveries. If you have your own ODICA insurance, you must provide a copy of this insurance which specifically names Airspace Technologies as being endorsed or covered by the policy to partners@airspacetechnologies.com, and the $1.84 will not be deducted from each trip. Airspace does not pay for deadhead miles (the miles you drive to the pickup location or from the delivery location back to your house). What insurance do I need to drive with Airspace? Per state law, when driving your car for personal use, you need to have personal auto insurance coverage that you purchase on your own. In order to drive with the Airspace platform, you need to have On-Demand Independent Contractors Association (ODICA) insurance. An 8 digit long tracking number provided by the airlines. The process of delivering a shipment to an airline. The process of picking up a shipment from an airline. IAC stands for Indirect Air Carrier. The person or entity who is shipping the package. The person who will be recovering the package from an airline. ©2019 Airspace Technologies. All Rights Reserved.